Porto is an Responsive Joomla Theme that is extremely customizable, easy to use and fully responsive. Suitable for every type of business, portfolio, blog and ecommerce sites. Great as a starting point for your custom projects. 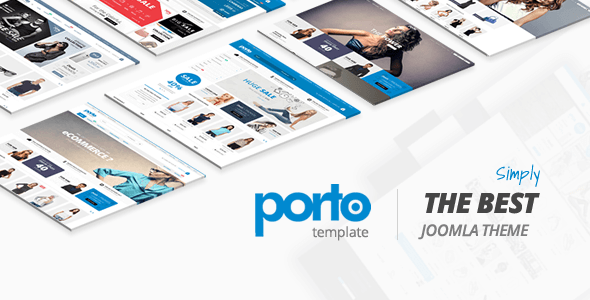 Porto includes 30 homepage layouts and skins and it has huge variation to be suitable for any purpose. More amazing features are coming soon! Powerful T3 Framework made with Bootstrap 3x. Drag & Drop Layout Builder and Page Builder Pro Integration (Save $39). Carousels, Slider, Buttons, Gallery, Team, Tabs, Accordions, Countdown, Animated Number, Modals, Timeline, Person, Pricing, Pie Progress, Google Maps and Ajax Contact forms, Call to Action, Buttons, Testimonials and more. - Added porto image slider addon for SP Page Builder. - K2 Blog created date in list view shows wrong date issue. - Portfolio page testimonials section shows when disable in backend issue. - Portfolio page live preview arrows shows when disable in backend issue. Added porto team advanced addon for SP Page Builder. -Updated Smart portfolio component latest version. -Updated Hotal reservation component latest version. - Portfolio Component item Save & Close issue fixed. - Hotal reservation Component item Save & Close issue fixed.